Hello everyone! What would you do if you won a $400 or $200 Disney Gift Card? Well, you have a unique opportunity to do just that! My Dreams of Disney has joined forces with a great group of blogs — which you can see below — to offer up $600 worth of Disney Gift Cards! There will be two winners — a $400 Disney Gift Card and a $200 Disney Gift Card! With all of these great sites, you are sure to learn something new by visiting them! I think the number of sites just demonstrates how popular Walt Disney World and the other Disney parks truly are! 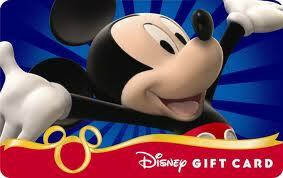 Either Disney Gift Card would be a great deposit or payment towards your next Disney vacation! $400 or $200 in a Disney Gift Card would be a great way to take care of your Christmas or Holiday gift shopping for your family! If you win the $400 Disney Gift Card, you could use the gift card to pay for almost all of a 10 day Walt Disney World Park Hopper ticket for one adult. If you are going to be in the area, you could use the $400 Disney Gift Card to pay for 2 adult and 2 children (ages 3-9) tickets for Mickey’s Not-So-Scary Halloween Party, with plenty to spare! Last, but certainly not least — especially in my wife’s mind — you could use your $400 Disney Gift Card to purchase 106 Mickey’s Premium Ice Cream Bars, or your $200 Disney Gift Card to purchase 53 of them! The sweepstakes continues until 11:59PM on Monday, October 14, 2013. The winners will be selected on Tuesday, October 15, 2013 and notified by email. He or she may also be notified via social media outlets, but the official acceptance of the prize must be in the form of a reply email to the one that we send out, so make sure that you provide good email addresses that you check regularly. The sweepstakes is only open to people in the United States age 18 years or older. We are sorry that we can’t open it up outside of the US. Now go ahead and get your entries in, and good luck everyone! It’s the final weekend in our Disney Gift Card Giveaway! Thank you for the gift card giveaway, it is a very nice thing that you have done. Next Post: Wordless Wednesday – Food, Wine, and Music!